In the online world, joint venture marketing is commonplace. From affiliate marketing (not my personal cup of tea) to partnering to produce webinars and other online programs, entrepreneurs leverage collaboration for mutual financial success. The same, however, isn’t true for most lawyers who are so focused on what can go wrong with joint ventures — that lawyer will steal my business! or what if a joint venture on ads gives rise to an implied partnership and I’m sued? — that they miss out on the potential benefits. That’s unfortunate — because joint marketing venture can create significant opportunities for lawyers. Here are a couple of joint marketing scenarios and the potential benefits. By teaming up with a lawyer in a compatible practice area – say, an estate planning lawyer working with a family law attorney – you receive the benefit of a personalized introduction to an entirely new audience of potential clients. And by working closely with other attorneys and learning about their approach and knowledge first-hand, you can feel more comfortable making a referral to your clients who may need assistance on a matter where you lack expertise. These same benefits accrue from a collaboration between an attorney and another professional – a CPA, a psychologist, engineer, a forensic expert or other non-lawyer who offers services in the same field. Working with lawyers in the same practice area can also be beneficial if you bring different strengths to the table. For example, if you’re a junior lawyer working with a more experienced colleague, your marketing efforts may attract clients who can’t afford a senior lawyer’s rates. Meanwhile, you may be able to leverage social media channels and provide your colleague a presence on sites where he previously lacked any visibility. In addition to these kinds of synergies, joint marketing ventures offers practical benefits. By teaming up with other lawyers, you share both the work and the costs, so your marketing dollars go farther. Plus, collaboration fosters accountability: whereas marketing is the first thing to slide when lawyers get busy, you’re less likely to slack off when others are depending on your participation. The success of your joint venture will depend in large part on who you decide to work with. Most importantly, you want to select a partner who is as hungry as you are and shares your goals. Many years ago, I attempted to form a marketing collaborative with a group of lawyer in my field that never got off the ground. As it turned out, while I was bent on ramping up my practice once my daughters were back in school, two of the attorneys were simply interested in finding full-time work while the others were on the verge of retirement and only wanted an occasional project to keep busy. It’s also important to seek out colleagues who share a similar appetite for risk and approach to ethics. 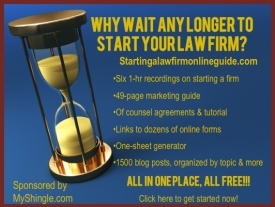 There are dozens of ways that lawyers can collaborate on marketing from one-time activities like co-hosting a networking event or a seminar to more on-going events like forming a mastermind group or a networking roundtable like this one which has lasted 18 years and is still going strong. Lawyers can also collaborate on projects like The Candid Counsel , a group blog by four former big-law and in-house women attorneys turned law firm owners who share their years of experience representing business clients. If you’re teaming up with another attorney to market to the public, you want to make clear that your firms are completely independent entities to avoid giving rise to an implied partnership. Otherwise you could wind up on the hook for your colleague’s malpractice. One reason that lawyers often choose to start their own firms is because they don’t play well with others. But as much as solos may like working on their own and calling their own shots, collaboration offers substantial benefits that lawyers miss out on by insisting on going it alone.